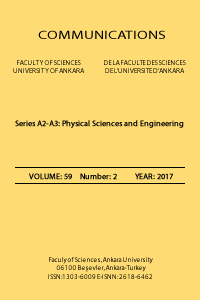 ﻿Communications Faculty of Sciences University of Ankara Series A2-A3: Physical Sciences and Engineering is a peer reviewed journal which has been published since 1948 by Ankara University, accepts original research articles written in English in the fields of Physics, Engineering Physics, Electronics/Computer Engineering, Astronomy and Geophysics. Review articles written by eminent scientists can also be invited by the Editor. The scope of Communications Faculty of Sciences University of Ankara Series A2-A3: Physical Sciences and Engineering is the original research articles of all areas of Physics, Engineering Physics, Electronics/Computer Engineering, Astronomy and Geophysics.